The TWU is always concerned about how our members are treated at work – from good Agreements to protecting them from personal harm. 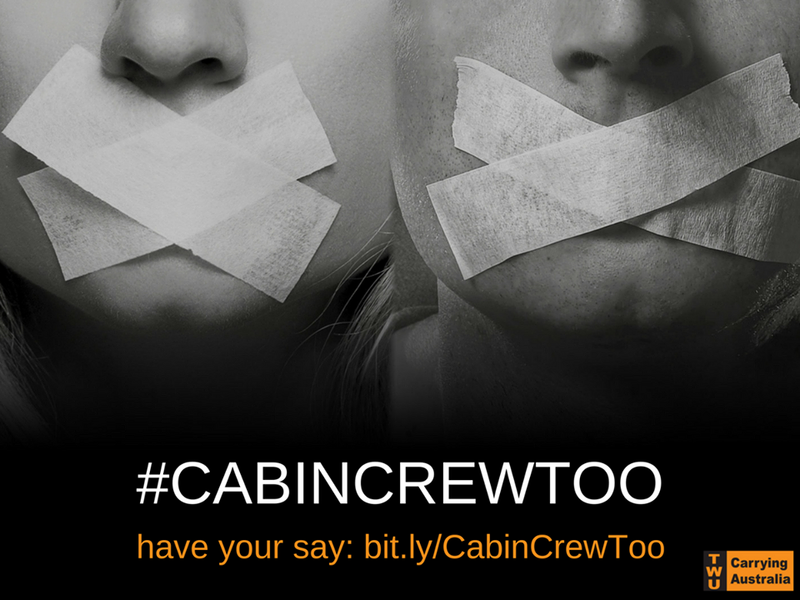 This is why we are investigating how airline management handle sexual harassment of cabin crew – please complete this confidential survey: bit.ly/CabinCrewToo and share with your colleagues. Our feedback from members is this has to change. From sustained bullying, harassment and intimidation to “innocent” touches from passengers – it is never okay. As if hard-working cabin crew don’t have enough to worry about without being sexually harassed. Passenger assessments, extreme weather events, serious mechanical issues and many more scenarios play out with regularity in the sky that require the focused and expert capabilities of professional flight attendants. Quite simply – without cabin crew, planes do not fly. The survey is for information purposes only and will be treated with strictest confidentiality. This can be an upsetting issue, but support is available. 1800 Respect offers a 24/7 national helpline providing confidential information and counseling. Call 1800 737 732 or visit www.1800respect.org.au.